After a few days of intense urban eating and fast city shopping, team #fatty was hitting the wall. I know, hard to believe, right? But it’s true. We’ve a way to go before we can truly call ourselves semi-professional eaters. So for a change of pace, @eatnik suggested we head out to the New Territories. Or the boondocks, for those who aren’t suburbially inclined. It took about half an hour to reach on the train, but it felt a world away from the looming skyscrapers of Hong Kong proper. You could see blue skies in more than slivers, and there was a landscape rather than a skyline! There are freaking hills out there! Okay, okay, so that wasn’t actually what we were after. We were looking for, as @eatnik rightly dubbed it, “The Food Court of Awesome”. But the respite from the frenetic buzz of the metropolis was a nice added bonus. We wandered through a couple of floors of wet market; seriously, they’re everywhere in Asia, and they’re so cool (go population density!). 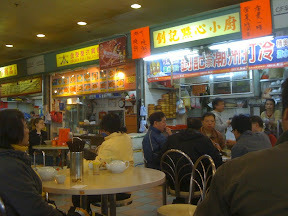 On the top floor, there is what is referred to as a cooked food centre, though we’d refer to it in Australia as an overgrown food court, and in Singapore, they’re known as hawker centres. Same same, but different. After doing a lap of the centre, noting the peculiar-yet-familiar grouping of all female and all male tables of high school students, and being wooed by various stall owners, we decided to start off with some yum cha style dumplings.The first to arrive were the classic har gao (prawn dumplings) and siu mai. The skin on the har gao were a little claggy, and the filling was over-seasoned – with MSG, I believe – so not the best of starts for the Food Court of Awesome. In the FCA’s defence, we were supposed to be looking for fish ball noodles, as that’s what the place is known for, but we got distracted. 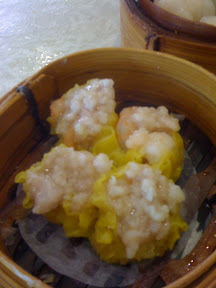 Then there were the siu mai. As you might have started to gather, everything this joint served up was on the rustic, or crude, side. The dumplings lacked the finesse of their big city counterparts, but there was a certain yokel-ish charm to it all. 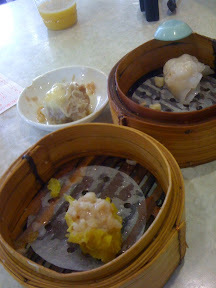 That charm included what we surmised was a near equal proportion of pork meat and pork fat in these dumplings. Flavoursome, but also a little overwhelming. 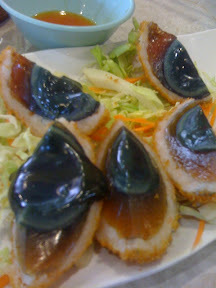 Doing things differently, however, also leads to sparks of creativity, such as in these quail egg dumplings. The quail egg was perched on a lump of minced pork – which unfortunately tasted like Chien Wah dim sim meat – with a delicate translucent wonton skin-like wrapper. A great idea, just executed a little, well, crudely. 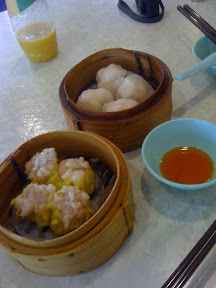 I should mention at this point that the total cost of these dumplings was somewhere in the vicinity of $6 AUD. Which is why we didn’t really think it was so bad. Especially since we spent the same amount on a single dish from the vendor next door – whom, incidentally, I believe was just a reseller for this next dish – which made the half-hour train trip, and the mediocre dumplings, worth enduring. Redemption for Tai Po came in the form of eggs. I give you fried century eggs. That’s right, FRIED. CENTURY. EGGS. Coated in a thin layer of prawn mince then crumbed and deep fried, and served with a sweet, mild nam jim – it was from a Thai food stall – these things are intoxicatingly good. 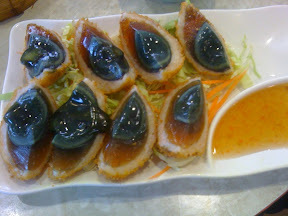 The heady richness of the century egg, with the slight tang of the runny black yolk, is tempered by the salty prawn meat and lifted by the texture of the crunchy coating, in the way only deep frying bread crumbs can. There were other adventures to be had in Tai Po, involving geese, egg tarts and little old ladies, but those are tales for another time. Never one to miss joining in on a chorus, here’s my take on the recently(ish) opened China Red. Compare and contrast with that of Penny and Jess. Oh, and The Age. 1500 words due in at the end of the week. A while ago, a colleague of mine told me how her husband had been to this place in Chinatown where you can order the food off touchscreens. I was immediately intrigued. She also said that he claimed they produced the best xiao long bao in the city. Doubly intrigued. So it took a little while, but I ventured down, and caught up with my old housemate La Singe for lunch one day. Before mid-afternoon karaoke. Because that’s how we roll. We had some fun playing around with the touchscreens, and in the end, because we were both a little ill, we both chose soup noodles. Yes, we were ill, and karaoke was on. Because that’s how we roll. I chose the venison noodle soup. It wasn’t that exciting, which is just was well, because bland food was what the doctor ordered. The venison was well cooked, though not particularly gamey – I like gamey, because that’s how I roll – which was a bit disappointing. The noodles were pretty good too, though I’m not sure if they were hand-pulled. Looking back at these photos, I’d have to say they don’t look it. La Singe had the mushroom noodles – I think it was called something like ‘Eight Treasure’ mushroom noodles, but the flowery over-promising artistic licence is to be expected of a place which has a section on their touchscreen menu called ‘Melbourne-style Classics’. These classics include such gems as Sweet and Sour Pork, and Lemon Chicken. Yeah, Melbourne-style. If you live in Zone 2. Anyway, La Singe really enjoyed her noodles, and the little bit of broth I tried seemed to be a lot more packed with umami than my own. Next time I went back, it was with young Master Dumplings. Given it was the first time we met in person, I figured we should really have dumplings. So we tried the xiao long bao. Penny’s right, and my colleague’s husband is, sadly, wrong. These are far from being the best in the city. HuTong‘s are streets ahead, and I think even Dumplings Plus‘ version are better. The main problem I had with China Red’s xlb was that there really wasn’t enough flavour. And there was a strangely consistent amount of cooked blood in each one. Not sure what was going on there, but texturally, it didn’t really belong. The steamed dumplings were considerably better. While not stellar, if all your regular dumpling haunts are full, China Red isn’t a bad option. Again, the filling lacked flavour for my taste, but the skins were satisfyingly doughy. We also tried the kim chi fried rice, which on the touchscreen, was adorned with one (out of a possible three, I believe) chilli. It didn’t live up to the advertised spiciness. Thankfully, the chilli oil provided at China Red is pretty damn good – there’s some Sichuan pepper in the mix – so we just adjusted to our own needs. China Red is an odd place. The touchscreens are fun, and the food is decent, if not that great. The service is a little too attentive – on account of the waiters not having to take orders? – and plate clearance will be requested by staff before you’re finished. All in all, I’d go there again, but I’m not sure I’d suggest it to others. There are too many other good options in the vicinity. So at the risk of becoming more of a dumpling blogger than a foodblogger, here is my long-overdue post about the dumpling munching that occurred for Mr E’s birthday. There was a massive table of twelve, hence an epic amount of food was ordered – for future reference, there are both positives and negatives for letting one person order for twelve. On this occasion, the positives were that the person in question knew her way around the Hu Tong menu, and clearly knew what she was doing; the negative being that we all ate until we could barely move. Oh wait, that’s just another positive! Anyway, on to the food. We started out with some snow pea sprouts with garlic. Always a winner. Did leave me open to the trap of eating rice, however. My mother labels people like me ‘rice buckets’ (faan toong). I love my rice. A word to the wise: don’t waste your time with rice at Hu Tong. Next came the state dumplings with brisket. This dish was my request, as I had tried it before, on my last visit to Hu Tong. If you’re in a small group, I think it’s a great dish to order, because you get dumplings, but also beef brisket in the one dish. WIN! The brisket is tender, well flavoured, and the dumplings get the chance to soak up some of the flavour from the brisket sauce/soup. Some sort of vegetarian noodle dish. I didn’t bother trying that one, because by this stage, I had been made aware of what was to come. It didn’t look particularly exciting, anyway. Are you ready? We’re about to take off. First up, wontons with chilli oil. Probably the dish of the night. I couldn’t stop going back for more, which was fine, because aforementioned person-in-charge-of-ordering (PICOO) had ordered SEVEN dishes of this. The wontons themselves were perfectly cooked, and plump with flavour, and chilli oil was probably the perfect accompaniment. Well played PICOO, well played. The pan-fried dumplings arrived at our table, and people started digging in, before PICOO said, “hey, I didn’t order those!” “Oh well, too late.” They’re one of the stand-outs on the Hu Tong menu anyway, in my opinion. I love how they’re all joined by that slightly burnt pan-crust, like a bit dumpling crepe. Things had to be shuffled and removed from the lazy susan not long after, for the arrival of the king of Hu Tong specialties, the xiao long bao. A steamed pork dumpling with soup inside, this is probably the dish that sets Hu Tong apart from the rest of its dumpling competitors. I’m fairly sure you won’t find a better example of it in a Melbourne restaurant, though I would be somewhat ecstatic to be proven wrong. Again, PICOO ordered SEVEN serves. Which in hindsight, wasn’t such a smart thing, as they started getting cold before we could skarf them all. And a good xiao long bao is a hot xiao long bao. 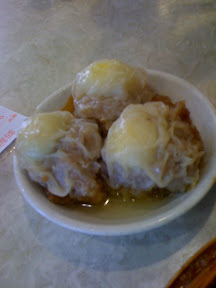 Now while dumplings are the main reason you go to Hu Tong, there are other gems on the menu. Though I’m fairly sure it’s more Sichuan than Shanghainese, this chilli chicken was awesome, regardless of its geographical cultural origins. Unlike my first encounter with this style of chilli chicken many years ago at the original Dainty Sichuan in Smith St Collingwood, there was a generous amount of chicken on the plate – Dainty Sichuan’s version used to be about two thirds dried chilli – and was beautifully spiced. This would be up there as a perfect beer snack. Well, beer meal. It was a mammoth plate of chicken. Ma po doufu. A classic dish – I defy anyone who doesn’t like tofu to try this dish and still refuse to eat tofu. Hu Tong’s version was good, but probably not the best version I’ve ever had, though I am partial to my mother’s. That sort of goes without saying. Just another shot of the ensemble of food, so you get an idea of how much there truly was. Finally, out came the Sichuan chilli fish soup. Yes, they’re all dried chillies floating in that soup. It’s also full of Sichuan pepper, which has that wonderful eucalypt-meets-sour tang to it, and starts numbing your tongue after a couple of mouthfuls. I couldn’t handle too much of this soup – apart from already being full by the time it arrived at the table – but luckily there were some true chilli fiends at the table. All in all, a fantastic night, despite having to wait for about fifteen minutes for a table, even though we had booked ahead. Definitely going back for more! I was excited when I first came across Dumpling Sisters. I was walking home after going to the gym, and upon seeing the cutesy logo, I was ruing the fact I’d already stopped off for dinner right after my workout. I started tweeting about the place, assuring @jeroxie that it actually existed, and wasn’t a mirage of oily goodness in the wilds of Exhibition St. Well I finally got around to visiting it post-gym last week. While I’m all for simple and unassuming decor, I think I would really have enjoyed eating at Dumpling Sisters more if it weren’t for the unrelenting fluorescent lighting. Combined with freshly painted white walls, it’s confronting in the same way an industrial factory cafeteria would be, I imagine. Or the way eating in a 7-11 would be. The service, however, was attentive and exceedingly smiley. Such a far cry from the surly demeanour of the staff of the-dumpling-place-that-must-not-be-named. I’m not sure if there’s a self-service station I wasn’t aware of, but I had to ask for a bowl for my dipping sauce. It came with sincere apologies and mild embarrassment on the part of the waitress. I’m thankful it was a post-gym visit, because then I didn’t feel quite so guilty about ordering the pan-fried pork dumplings (12 for $7.80). They were pretty good, but not the best I’ve had – probably in the league of Chinatown Dumpling, but not quite Shanghai Village, Dumplings Plus or Hu Tong. 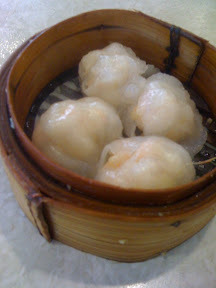 And I have to say, for pan-fried dumplings, there certainly was someting of a deep-fried quality to these dumplings. Which made me feel a little guilty, so I ordered a side dish of celery and peanuts ($3). These are cold, and the salt is offset by the sweetness of the celery and carrot. Don’t be scared by the chilli flakes; it’s really not spicy at all. It was quite moreish, actually. I didn’t find my first visit to the Dumpling Sisters (and yes, I think the owners are two middle-aged Chinese sisters) all that stellar, but it’s not a bad place, if you can get past the lighting.